The zygomaticotemporal nerve arises from a foramen located on the anterior wall of the temporal fossa. This foramen is located at the back of the lateral orbital rim, posterior towards the zygoma at the plane of the lateral canthus. The zygomaticotemporal nerve travels with the lower outer part of the orbit and also gives a branch towards the lacrimal nerve. It then travels from a small canal in the zygomatic bone and connects with the temporal fossa afterwards. It superiorly travels in the middle of the bone as well as the temporalis muscle. It will afterward travel via the temporal fascia superior, a little towards the zygomatic arch and supplies the skin of the temple region. 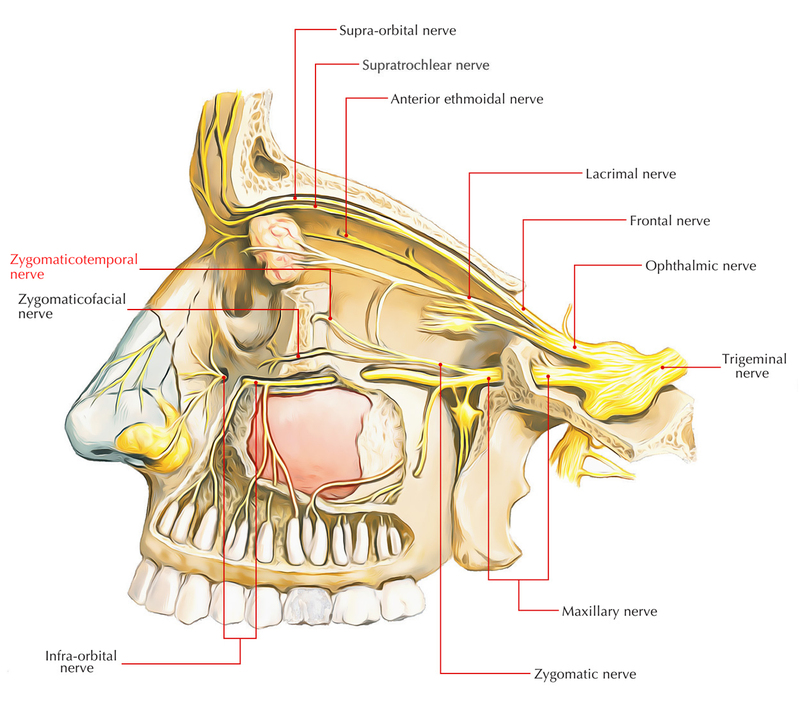 It creates the mandibular division of the trigeminal nerve after it anastomoses with the facial nerve and the auriculotemporal nerve. It also sends a small branch between the two layers of temporal fascia, when it pierces the temporal fascia, in order to reach the outer aspect of the eye. In order to penetrate the temporal fascia and supply the skin of the temple, the branches of the zygomaticotemporal nerve pass superiorly in the middle of the bone and the temporalis muscle.